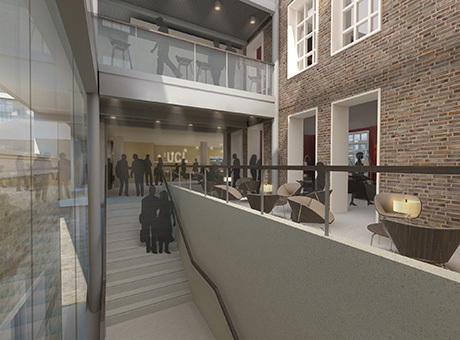 UCL Environmental Sustainability have given a £25,000 grant to support the energy saving and environmental sustainability ambitions of the Faculty of Laws redevelopment of Bentham House. The grant will be used to replace the buildings lighting control and lighting systems, introducing for the first time user presence detectors, timers, zoning and offers a base on which to replace the legacy CCFL and halogen lighting solutions with modern LED alternatives. Through this grant, per-year energy savings can be as much as £35 per-light fitting, representing a considerable saving in energy consumption across the nearly 200 rooms that will make up the new Bentham House. The grant will help the Bentham House project to achieve not only a reduction in the operational costs associated with the running of the building, but will also help the programme as it strives to achieve an Excellent grade in the internationally recognised BREEAM environmental assessment framework against which UCL benchmarks the environmental impact of all of its Capital Investment Programme projects.